Cologne - 1. FC Köln and VfB Stuttgart played out a goalless draw at the RheinEnergieStadion that does little to ease either side’s relegation fears. Stuttgart looked the more likely to fashion a breakthrough, but the closest they came to snatching all three points was when Moritz Leitner’s free-kick was tipped onto the woodwork by Köln keeper Timo Horn. The Billy Goats made the perfect start to their Rückrunde with a 2-0 win at Hamburger SV on Saturday, but Peter Stöger’s side have been a different animal in front of their own fans this season, winning just one of their nine home league games prior to the Matchday 19 encounter. They were lucky not to fall behind after seven minutes when Sercan Sararer picked our Leitner in the box, but the midfielder failed to guide his effort on target. Like their hosts, Stuttgart have been far more successful on their travels this season and the Swabians continued to dominate proceedings at the RheinEnergieStadion, with the influential Leitner dictating the play in the centre of the park. Austria international Martin Harnik was next to try his luck for Huub Stevens’ side, forcing Horn into a good save with a snap-shot from the edge of the penalty area. Goal-scoring opportunities dried up a little as the half progressed, with Köln struggling to pierce a resolute Stuttgart rearguard. 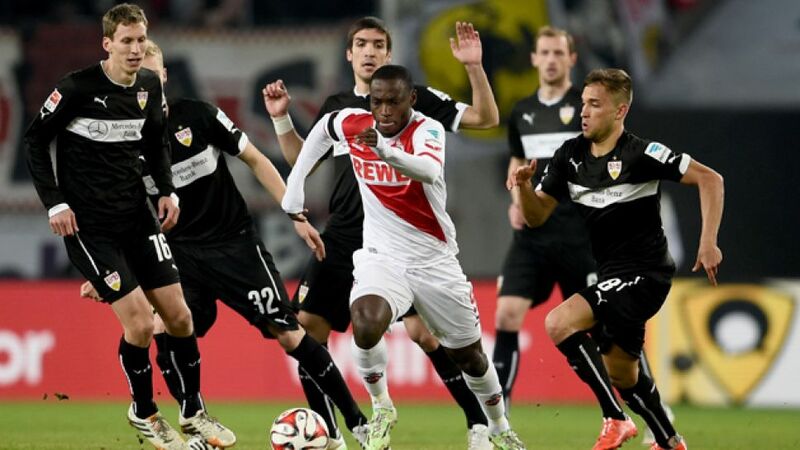 Nigerian striker Anthony Ujah, whose first three Bundesliga goals all came against the Swabians, was being well-marshalled by Timo Baumgartl and Georg Niedermeier, while Harnik’s effort was the best Stevens’ side could offer in the opening 45 minutes. However, the Baden-Württemberg club emerged for the second half with renewed energy and Horn was forced into action eight minutes in to deny Sararer, who had capitalised on Jonas Hector’s poor clearance to fire towards goal from a tight angle. The deadlock was nearly broken in bizarre circumstances just before the hour mark when Leitner’s overhit free-kick had to be tipped onto the crossbar by a retreating Horn. Both sides soon brought on fresh legs in an effort to add more zip and zest to their attacking efforts, Stevens’ introducing 18-year-old Timo Werner and Köln coach Peter Stöger throwing on Japan international Yuya Osako. Although neither team was able to break the deadlock, Stuttgart climb out of the automatic relegation places on goal difference after Hertha Berlin slumped to defeat at home to Bayer 04 Leverkusen. Köln, meanwhile, remain in 11th after failing to win at home for the fifth consecutive league game.